💕 Two Hearts Emoji is an image of two red hearts, one of which partially overlaps the other. This emoji is widely used to express warm feelings, love and romance. This emoji is present in many romantic texts, and can mean everything that is related to it: from "love is in the air" to the deeper and mature emotions. Sometimes used by girls simply to decorate warm friendly letters. 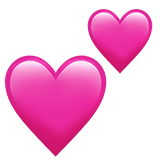 Two Hearts Emoji was approved as part of Unicode 6.0 standard in 2010 with a U+1F495 codepoint, and currently is listed in 😀 Smileys & Emotion category. 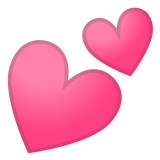 Use symbol 💕 to copy and paste Two Hearts Emoji or &#128149; code for HTML. This emoji is mature enough and should work on all devices. You can get similar and related emoji at the bottom of this page.